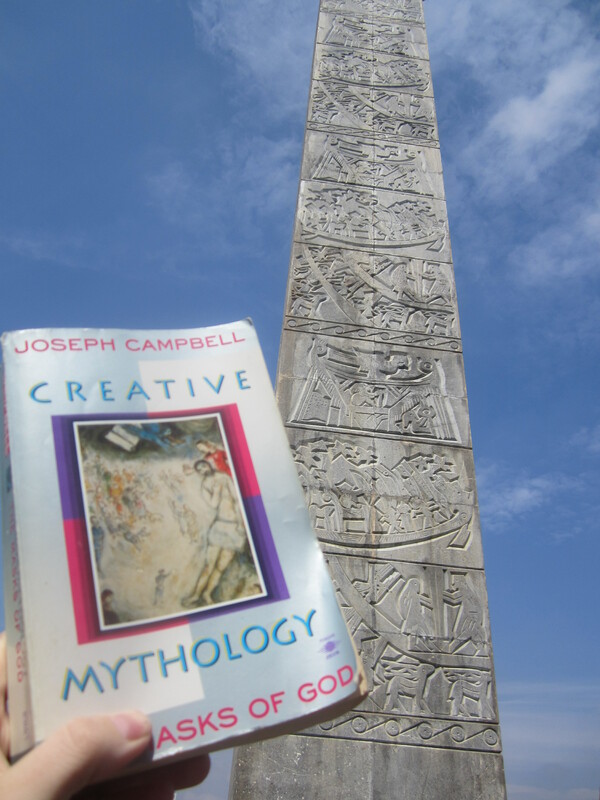 In Creative Mythology (Vol. 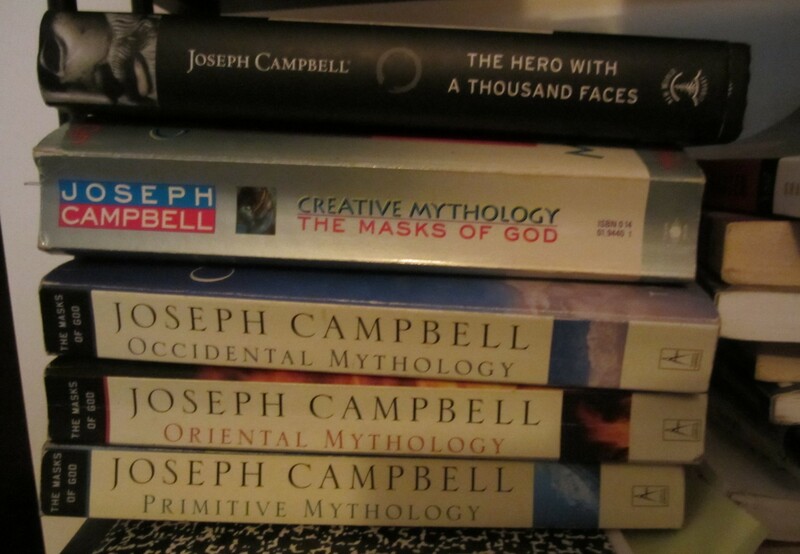 4 of The Masks of God series), Joseph Campbell explains the meaning and connections to Beowulf’s name to that of other cultures: ”The name Beowulf itself, ‘bee-wolf,’ apparently meaning bear, suggests affinities with a widely known folktale figure of prodigious strength, the Bear’s Son, the distribution of whose appearances, in North America as well as Eurasia, points to a background in that primordial cult of reverence for the bear discussed in Primitive Mythology, and which is still observed among the Ainus of Japan” (p 123); and Campbell also explains the sea-monster Beowulf slays prior to the book ever beginning: ”The old Sumerian serpent-god Ningizzida is the ultimate archetype of this lord of the watery abyss from which mortal life arises and back to which it returns” (Creative Mythology, p 17). …had me firmly and fiercely in his grip; yet it was granted to me that I pierced the monster with my point, my battle-spear. The rush of battle carried off the mighty sea-monster by my hand (p 23). The turmoil stirred up the sea-monsters. One of them attacked me, dragged me down to the bottom where the weight of the sea would have crushed any other man. But it was granted to me that I might kill him with my sword, which same I did. Then others attacked. “They pressed me hard. I killed them, nine old water nickers, robbed them of the feat they expected at the bottom of the sea. In the morning, sword-ripped, they lay belly-up near shore. They’d trouble no more passing sailors after that. Light came from the east and, behold, I saw headlands, and I swam to them. Fate often enough will spare a man if his courage holds (p 162). Grendel, as one might can well see, is a superb companion to the ancient narrative Beowulf. And the climax of Grendel is but the first meeting with Beowulf, who rips the monster’s arm off and hangs it above the door. A shock goes through me. Mistake! He has wings. Is it possible? And yet it’s true: out of his shoulders come terrible fiery wings. I jerk my head, trying to drive out illusion. The world is what it is and always was. That’s our hope, our chance. Yet even in times of catastrophe we people it with tricks. Grendel, Grendel, hold fast to what is true! 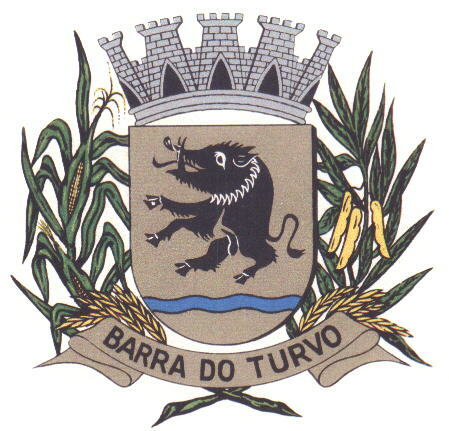 (p 168-169). ”Then the prince of thanes, the man bold in deeds, made glorious with fame, the hero terrible in battle, came in to greet Hrothgar. 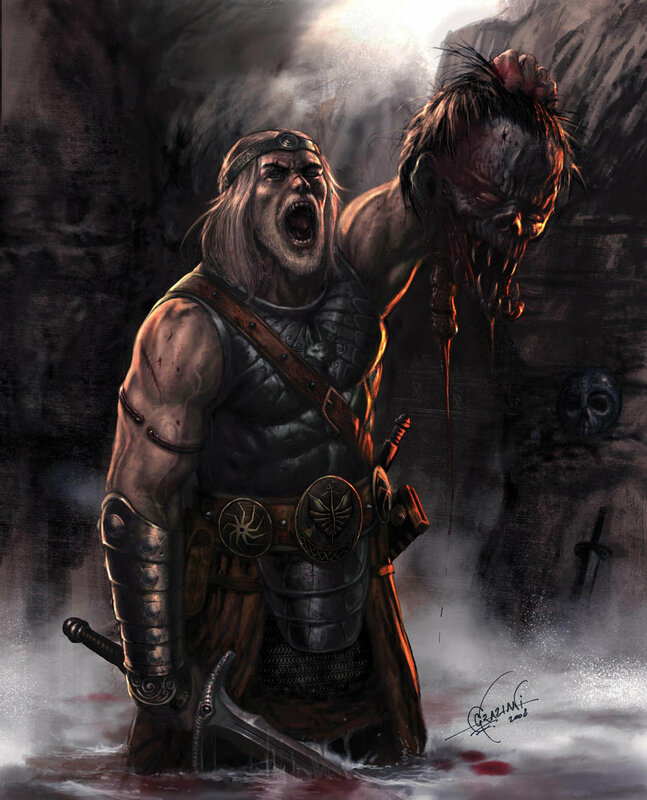 Then Grendel’s head was borne by the hair into the hall where the men were drinking–a dread object for the earls and the queen with them; the men looked at the wondrous sight” (p 62). ”I avenged all that. 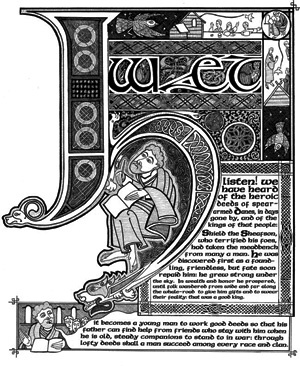 Thus none of Grendel’s kin upon earth has cause to boast of that uproar at dawn, not he who lives longest of the loathly race, snared in sin” (p 76). Ah! But we do know by the end of the story that Beowulf has told such a grand lie. Grendel’s kin in the form of a dragon comes to seek revenge and the death of Ecgtheow’s son. In Joseph Campbell’s tetralogy The Masks of God, he lays out the basic formulation of two distinct cultures that is now considered the East and the West. The East was shaped into a Garden Culture (and here many scholars refer to this as the Eden Complex) and how women together as a whole unit gained power over the men and among their peoples by controlling a sustainable and diurnal crop that provided consistent sustenance, which later developed into animal husbandry and more complicated farming systems. The West, however, created peoples who developed from caves and harsh winters and wild hunts devoted to the individual success nourishing the tribe. 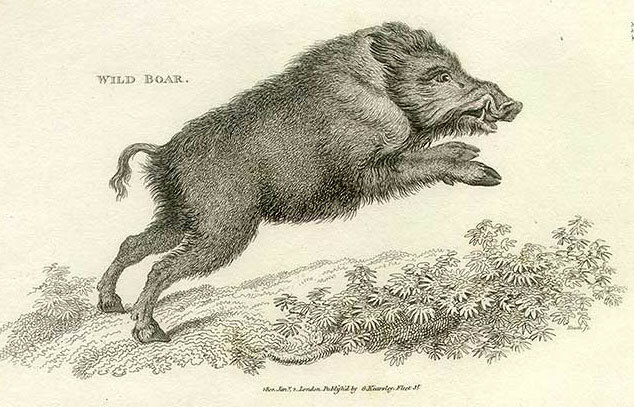 In many cultures around the world, made noticeable in William Golding’s Lord of the Flies, the boar culture established through the sacrifice and honoring of giant boars, which provided fresh meat rather than vegetables in the Garden Culture. But one point one should consider is the main difference of sacrifices between the two cultures. Human sacrifices dominated the Garden Cultures early on. 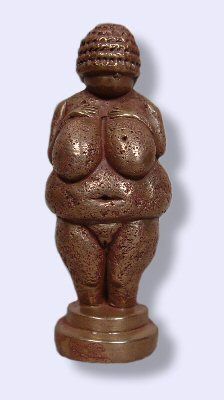 Human blood was thought to replenish the soil and create fertile lands, and we also see this in fertility statues of these same regions. And we do know that in Egypt, human blood after sacrifices flowed into rivers and washed downstream to help form a natural soap for washing clothes. 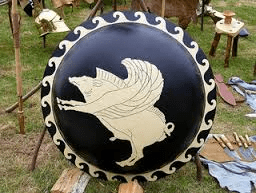 The Boar Culture, which can also be found in southern regions as well as the north long ago, substituted boars for humans in sacrificial practices. ”The natives declare,” writes Campbell in Primitive Mythology, ”that their boar offerings have taken the place of human sacrifices,” (p 448) but this same tribe also reserved special human sacrifices for those special men who sought the paramount crown. ”That was seen, widely known among men, that an avenger, Grendel’s mother, a she-monster, yet survived the hateful one, a long while after the misery of war” (p 49). ”On that pyre the blood-stained shirt of mail was plain to see, the swine-image all gold, the boar hard as iron, many a chieftain slain with wounds. Many had fallen in the fight” (p 42-43). ”The dread was less by just so much as the strength of women, the war-terror of a woman, is less than a man, when the bound sword shaped by the hammer, the blood-stained blade strong in its edges, cuts off the boar-image on the foeman’s helmet” (p 50). ”Speedily the wondrous wave-dweller was hard pressed in the waves with boar-spears [phallic symbols] of deadly barbs, beset by hostile attacks and drawn out on the headland. The men beheld the dread creature…And the gleaming helmet, which was to mingle with the depths of the mere, to seek the welter of the waves, decked with treasure, circled with diadems, as the smith of weapons wrought it in days long past, wondrously adorned it, set it round with boar-images, guarded his head so that no sword or battle-blades could pierce it” (p 55-56). ”Then the valiant one perceived the she-wolf of the depths, the mighty mere-woman” (p 58). 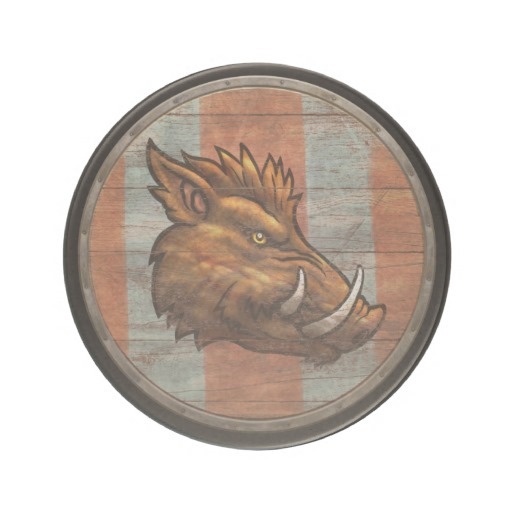 ”Then he commanded to be brought in the boar-image, the banner, the helmet riding high in battle, the grey corslet, the splendid war-sword” (p 82). ”Hrothgar spoke; he beheld the hilt, the old heirloom. On it was written the beginning of a battle of long ago, when a flood, a rushing sea, slew the race of giants; they had lived boldly; that race was estranged from the eternal Lord. The Ruler gave them final requital for that in the surge of the water” (p 64). 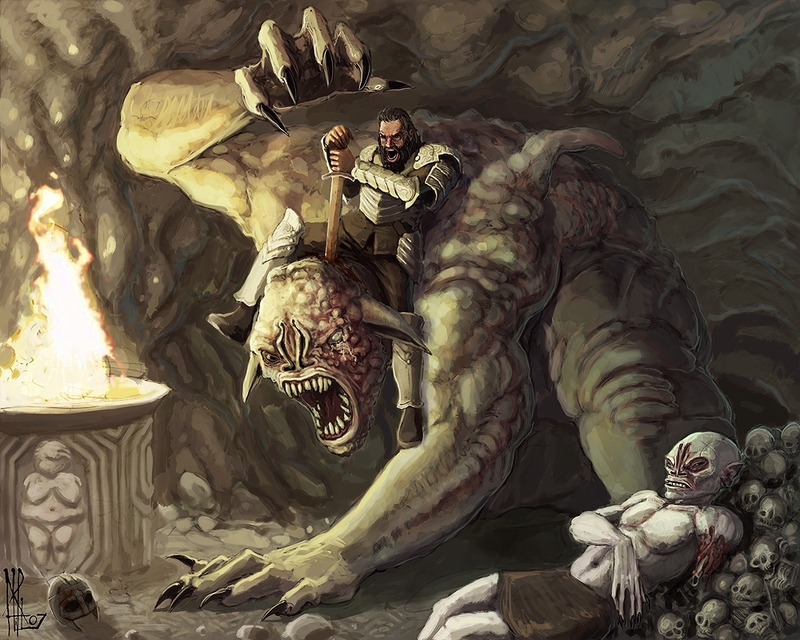 ”There was no trace of the dragon there, for the sword had carried him off. Then I heard that one man rifled the hoard, the old work of giants in the mound, laid in his bosom flagons and dishes at his own will; took also the banner, brightest of beacons” (p 103-104). him as no one else realize such distinctive about my trouble. anyplace, when i read this article i thought i could also make comment due to this good paragraph.